However, Flone quick install theme has 7 Header styles, 25+ Sections and 15+ pre loader. 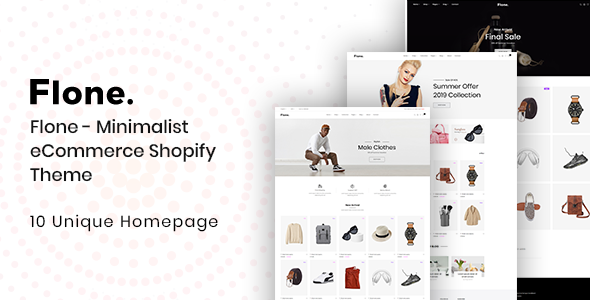 This responsive theme has tons of useful features like Shopify Builder, Theme Colors, Box Style, Newsletter Popup, Notification Bar, Ajax Wishlist, Ajax Popup Cart, Multiple Currency, Dropdown Menu, Megamenu and Megamenu With Image etc. In addition, it has Quick View, Coming Soon Page, Testimonial, Services, About Information, Product Video, Multiple Banner, Newsletter, Brand Logo, Latest Blog and many more. To bring more engagement of the clients, there are Contact Form, Product Review, Facebook Comment, Disqus Comment, Contact Map, Collection Sorting, Post Comment etc.